Meade Hill Road and Middleton Road, Prestwich, Manchester. Welcome One and All. We are delighted to welcome you if you have just moved into the area or are thinking of moving here. Please contact us if you require any help or advice with moving in or would like to find out more about the area or our Shul. We are a growing Shul who’s aim is to be there for you when you need us. It is an exciting time for Meade Hill Shul so feel free to browse our website to find out more, drop us a line or just pop in. Champions Wanted. We have a number of exciting new roles within the Shul on the Board of Trustees. Follow this link to find out more and get in touch for more information. Shabbat UK 2019 was absolutely amazing. Rabbi Peysach Krohn is a true Maggid, a master story teller. Each story was packed full of feeling, emotion and meaning. It was truly a pleasure to hear such wonderful tails, each of which encapsulated a different theme and took you to a different place, always with a view to improving yourself. Boykos is now Fully Kosher and is under the Manchester Beth Din. This is another example of how this area is growing for the Jewish community. So pop in to your local Windsor Road Deli, right next to Vidals kosher butchers for all of your essentials. Weekday Maariv is set at 7:30pm through the winter. Shabbos started with a thought provoking and humorous Introduction by special guest Rabbi YY Rubinstein of New York to a full Shul. We had a very lively Kabbolas Shabbos with our friends from Heaton Park Shul which was led by the Travelling Chassidim’s Chazzan R’ Arye Blum and his choir. Later at a packed Seuda, the young friendly families of the Travelling Chassidim sat among the Community, enjoying the meal together and breaking down barriers and stereotypes. 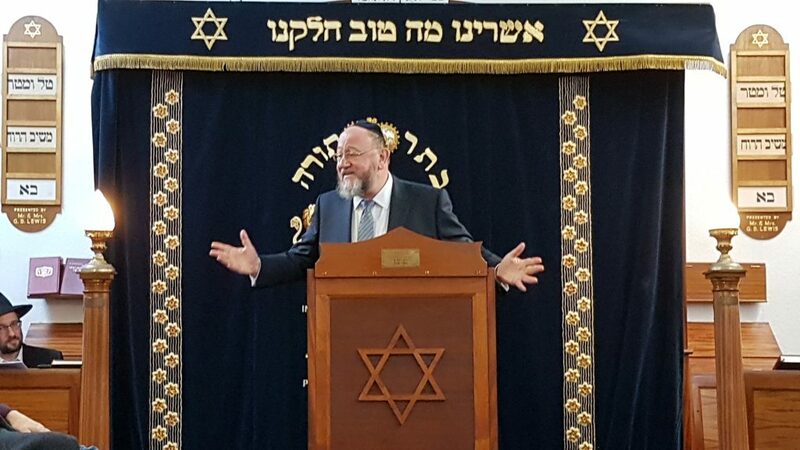 In between lively singing and dancing, Rabbi YY spoke in his inimitable style, with the crowds laughing and crying, and deeply inspired by his message. Shabbos morning brought another inspiring tefillo with the accompaniment of the choir and a thought provoking sermon from Rabbi YY. Members had never experienced a davening of such beauty and warmth. A wonderful seuda followed, again inspired by Rabbi YYs humour and pathos, and the singing led by the Chassidim. Then two of those present,an ex Pastor and an ex Seventh Day Adventist shared emotional words , describing their present journey towards conversion. 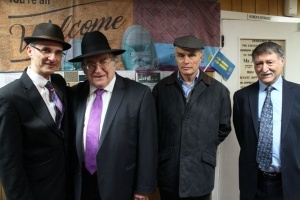 Their message inspired everyone how lucky we are to have been born into the precious gifts of Torah and the Shabbos. After a lively Mincha, the Community were again inspired , this time by Rabbi Aviv Bar Ilan’s heartfelt message of growth and of continuing the inspiration further. 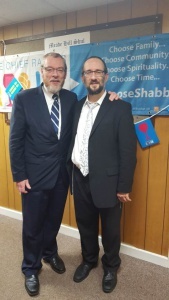 Rabbi Prijs shared stories of the power of Shabbos to connect Jews to their roots , and thanked the selfless Chassidim for giving up their Shabbos to inspir e others. And the climax of the Shabbos was the beautiful candlelit Havdoloh with the Travelling Chassidim. As Yissy Shadmi played spirited music, even the most reluctant people were swept up by the incredible ruach. Shtreimels and kashketels changed heads , and time was suspended in circles of pure unity between Yidden. 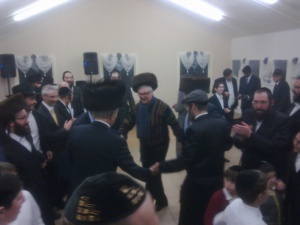 It was an unforgettable Shabbos for all those who experienced it. The ERUV is HERE The Shul are proud to be including in the Eruv. This means that you can now carry your prayer books and tallasim to Shul on Shabbos and Yom Tov, providing that you are also within the eruv boundaries. Please check the Eruv website for an up to date map. Office Opening Hours. The office is open on Wednesday, Thursday and Friday from 10:00 until 2:00 and Sunday from 9:30 until 12:00. Chief Rabbi Ephraim Mirvis visits our Shul. On-Line and Card Payments We have a Donations Page which can be used to make any payments to the Shul using your card. You will notice that our website is fully SSL secure (see the green padlock to the left of the address) so you can make your payment in complete safety. Picture Page – Check out our pictures page on the website. It shows some photographs of the Shul and previous events. Most of the photos were expertly taken by Stephen Spencer, so we thank him for giving us permission to use his photographs on our website. Click the link at the top to see them in all of their glory. Facebook Page. Click here to see www.Facebook.com/MeadeHillShul. Make sure to “Like Us” to hear all the latest news, views and discussions and keep an eye open for special offers. There are lots of pictures there from recent events and it is the best place to keep in touch! Birthday Kiddush Once per month we are delighted to invite all members who’s birthday fall in this month to a special Birthday Kiddush. If you would like to sponsor your birthday kiddush then please contact the Shul office or the Rebbitzen for more information. 110th Anniversary Gala Click here to see some wonderful feedback and photos to what was an amazing evening. Sunday Morning Learning Pop in every Sunday at 9:00am for Rabbi Steinberg’s shiur. Everybody is welcome and membership is not required. The shiur is followed by Shacharis and a begal brunch. Building Work We are about to initiate a major renovation plan to redevelop the site and build a brand new new Shul building. Please contact us if you would like to contribute in any way to this project.